Mr. Pietro Gussalli Beretta, President and CEO of Beretta Holding. Since October, the month of the official anniversary date, Beretta has been celebrating its 490th anniversary with special events throughout Europe and by providing the galleries in the U.S. and the Beretta Gallery in London with unique and special commissioned shotguns. These celebrations are shared globally through the company’s social media outlets. The 490 Serpentina is an absolutely unique side-by-side and destined to become a very collectible piece. When asked to design a commemorative, anniversary shotgun for the world’s oldest firearms manufacturer, the goal of the designer was to create not only an exceptional shotgun, but also one that depicts Beretta’s dedication to finding beauty in the marriage of tradition and technology. This dedication is realized in the 490 Serpentina side-by-side. 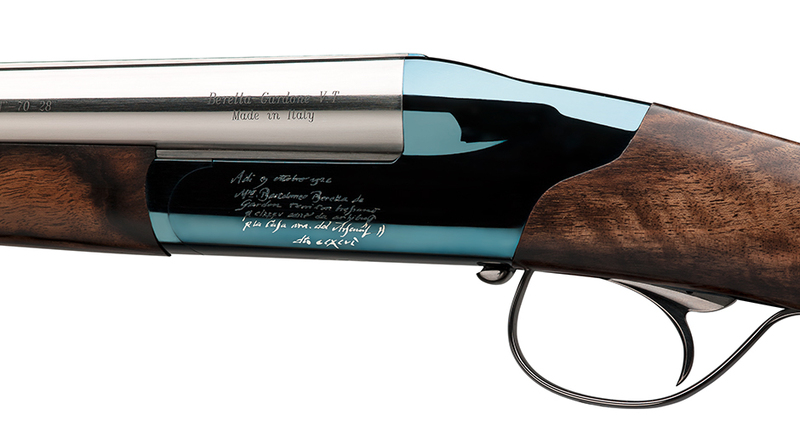 One of the most striking features of the shotgun is its blue receiver – a nod to the color most associated with the Beretta brand. As one’s eye travels over the receiver two more distinctive traits are noted. Instead of a top-mounted lever, the mechanism is located on the right hand side of the receiver to maintain an uninterrupted appreciation for the rounded, edgeless receiver, while the extremely elegant “wood bridge”, a technological innovation by Beretta that allows the tail of the receiver to be housed beneath the wood and leaves a seamless area between the receiver and selector/safety mechanism. To accentuate the beauty of the edgeless receiver the original bill of sale – an order of arquebus barrels from the Doges of Venice dated 3 October 1526, has been recreated and engraved in white gold inlay. And, adorning the trigger guard are three related and important elements; the recorded founding date of 1526, the age of the company 490, and the year the 490 Serpentina was made 2016. The barrels are of particular interest as their striking shine is achieved by hand polishing Beretta’s proprietary Steelium barrels until it achieves a mirror quality finish. The walnut wood stock and fore end are also notable for their lack of checkering – ensuring one is able to appreciate the grade 5 coloring and wood grain. The 490 Serpentina named for the anniversary and for its side mounted lever, which is designed to resemble a “small snake” comes in a handmade Churchill style case. Mounted inside the top lid of the case is a polished plate bearing the wording of the original bill of sale. The case is replete with a custom cleaning kit including Ebony rods and sterling sliver and horn containers.